Over the last few years composting has become a big thing, gardeners all over the world have taken up composting for themselves and all playing a part in reducing our need to thow stuff in the rubbish bin. Decreases their susceptibility to pests and disease. Water retention is more evenly balanced within the soil. The structure of the soil is improved. So the first thing to do, is get yourself a compost tumbler or a compost bin. A tumbler is the fastest at producing compost and the usual turnaround with Kedels ‘the dark destoyer’ compost tumbler is about 4-5 weeks. Now what to put in it. Good things to add to the compost bin. Make sure you provide the mix with the best possible conditions, so that you get your produce in optimal time. Rotate the drum daily to aerate the mulch inside the drum. Add water, moisten but don’t overdo it. Consistency is the key here. The moisture inside the mix should be around 50%, similar to that of damp clothes. Composting can be great fun. With a good rotating compost bin, you’ll be making compost in no time. How many people do you think are putting unwanted organic food waste in the bin, my guess is its a hell of alot. Thats a waste in itself! Get a compost tumbler and give your plants something to eat. Think of how much money you’ll save over the course of a year aswell as trips to the garden centre for that new bag of compost. Spring is here in case you haven’t noticed. Get your compost bin quick! 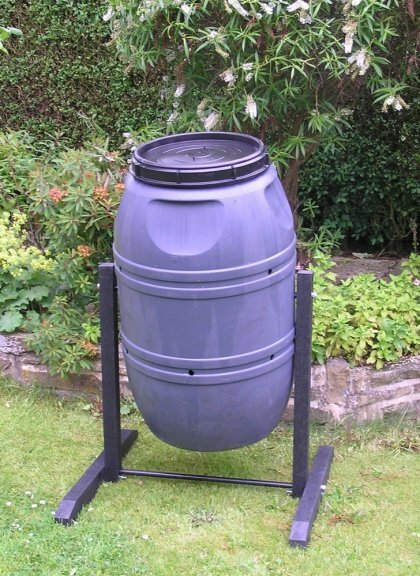 Compost bins and compost tumblers come in a variety of shapes and sizes. See how easy it is to use ours. Buy raised beds now, they are truly great!